Standard fields are flexible, custom field types that allow you to ask any kind of question in your forms. Unlike Database fields, Standard fields don't save to the profile card directly - instead they appear in the volunteer's form responses, which can be viewed in the 'Forms' tab of the profile card. Because of this, try to use standard fields only when you need to ask questions that don't need to be searched or referenced more than a few times. It's easier to search database fields. 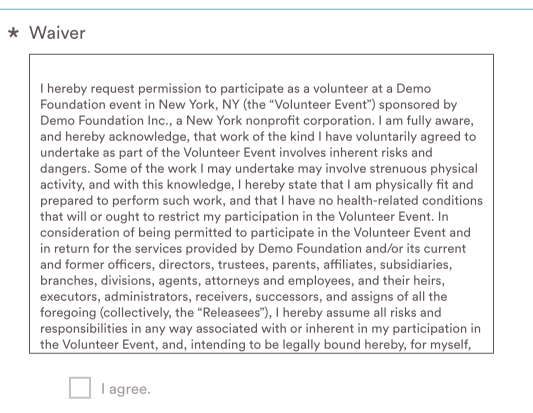 The short answer field asks your volunteers for a short text response - no more than a few words or a sentence. In the following example, it's used to ask for a sponsor's business name (the workplace database field is designed for individual volunteer records). There is a 'homepage' Database field that is perfect for your volunteer's personal websites, but if you need to ask for any other kind of website, you can use the Standard website field, demonstrated above. Be careful when using the Standard version of the Name, Email and Phone fields. This information is not stored to the profile card. These fields are useful, for example, if you're asking volunteers for the contact information of a friend they are bringing to an event. 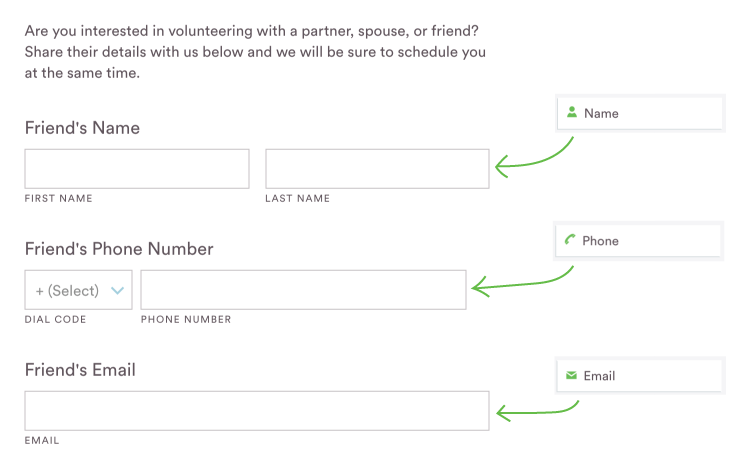 Note that there is already an Emergency Contact field, and you can create a custom relationship/contact (such as a volunteer reference) using the Database fields. The Long Answer text field allows your volunteers to respond in more detail to a question. There is no character or word limit on a long answer. The Number field is formatted to only accept numbers, not text. Use this field to ask for any question that requires an open-ended number as a response. Like the Number field, Currency is formatted to accept only numbers. It can be changed to specify US dollars, Canadian dollars, Euros, or Pounds Sterling. There is also an option to display cents or fractions. To edit this field's options, click on the field in your form after you've placed it. The dropdown field is easily customizable, and well suited for questions that have more than a few choices. 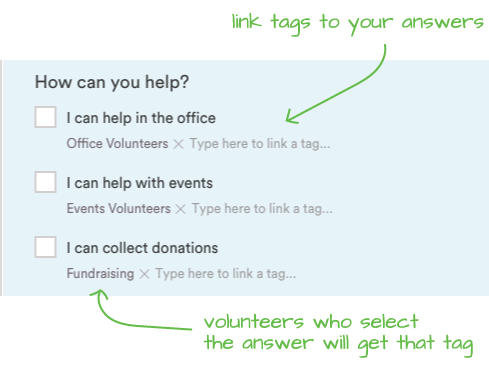 Use checkboxes to ask your volunteers questions that allow them to select more than one answer. Organizations on the Premium plan are also able to link tags to checkbox answers, making it easier to keep your community sorted, and never lose track of volunteer preferences. The Multiple Choice field requires your volunteers to select only one option. Like the Checkboxes field, Premium plan subscribers can link tags to multiple choice options. You can change the content and title of the Agreement field to suit your organization's needs. Create waivers, include confidentiality agreements, or specify the terms and conditions of volunteering with this flexible field.